My thoughts: I DEVOURED this book. I started it yesterday and just now finished it and woah, she was a gooden! First positives: this book was slow moving BUT and this might be the only time I ever say this but I LIKED that it was slow. Let me explain. The only thing I knew about this book prior to reading was the synopsis posted from Goodreads above. It’s a short one but very compelling. Drew me in instantly. 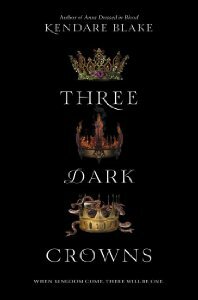 So the whole time I was reading this book (and each chapter focuses on one of the three queens so you get all sides of the story) I had the synopsis in the back of my head and kept reminding myself that two of these queens were going die. I alternated who I wanted to be queen throughout the entire book as I got to know each queen through their chapters. As it grew closer to the end, I literally had no idea who I wanted to survive but I knew I didn’t want any of them to die. However, Kendare Blake had me CONVINCED that 2 of them dying was the only option here. So the ending completely blew me away! I was left with my mouth hanging open. I had some questions, though, throughout the book that led me to give it only a 4 star rating but I have confidence that those questions will be answered in the next book. First and foremost being how the queens acquire their powers and how do they know so early which queen has which power if their gift hasn’t developed yet. But like I said, I feel very confident that we will get more into those answers in One Dark Throne. Another reason this only received 4 stars from me was I felt some of the sentence structure (especially within the characters’ dialogue) was a little awkward but it could just be a stylistic choice since this is obviously a totally different world and time period than the present. Below is the link to purchase this book from Amazon.com. If you use this link to buy the book, I will receive a small commission because I am an Amazon affiliate.